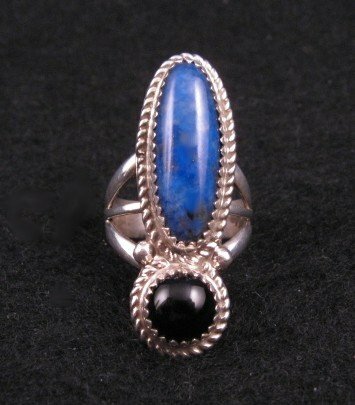 Gene & Martha Jackson created this classic sterling silver ring, set with beautifully polished deep blue Lapis and Black Onyx. Not sure which way to wear this ring on your finger, but it looks good in either direction. The face of the ring measures almost 1-1/2 long. Weighs 10.7 grams. Brand new and in perfect condition. Gift Box and Certificate of Authenticity included. Hallmarked by the artists. Size 7-1/2. Gene & Martha Jackson are members of I.A.C.A. and I had the pleasure of meeting them and purchasing this and other jewelry directly from them at the most recent IACA wholesale market. The workmanship is impeccable - you can always depend upon quality when you purchase a piece of Gene & Martha Jackson jewelry. About Gene & Martha Jackson: Martha and Gene Jackson are Navajo silversmiths from Arizona. They have been making beautiful handcrafted sterling silver jewelry since the 1980s. 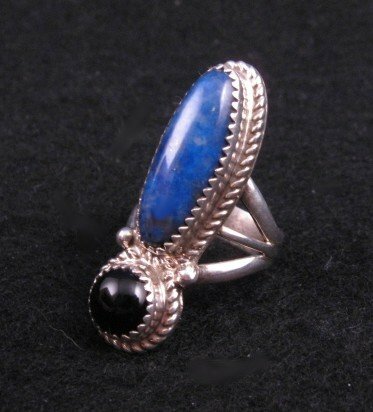 They are featured in many Native American jewelry books and have won many awards. Martha just recently passed away in January 2019.